Saturday’s fun and productive workshop, raw wool bag, nuno felt tutorial, vessel for sale …..
On Saturday Mairead and Sharon really knuckled down to create beautiful pieces of flat felt in the morning and both felted wonderful vessels in the afternoon. It’s always interesting sharing techniques with other artists because once I demonstrate the basic skills I love watching how participants use the creative process to get stuck in and bring their own experience to the felting table! Sharon had never felted before and although Mairead’s art practice is often textile based wet felting is not a technique that she has had much prior experience in either. I’ve posted images of their work to my mobile uploads on Facebook, have a look and I am sure you will agree they both did a wonderful job! I certainly enjoyed the day and I think that they both did too, in fact I was really fired up after they left and started a raw wool bag which I then had time to finish this morning. The locks that I used were local Jacob’s and the inside is a rich raspberry coloured wool which I bought at Felt in Focus 3 years ago, it just seemed to be a perfect marriage with the rich chocolate and creamy white Jacob’s fleece! I added a leather strap (an upcycled belt) for the handle and a cool vintage leather button for the closure. In fact, I think that the button graced a sheepskin jacket yonks ago (isn’t yonks a great word???) so how much more appropriate could the button be than that? The weather has been dreadful here for the last 48 hours. It is so wet that I haven’t a hope of getting outside to photograph my new framed landscapes, I wanted to get them uploaded to my Big Cartel shop but the light is so poor inside (because it is LASHING outside!) that I am going to have to wait another little while. 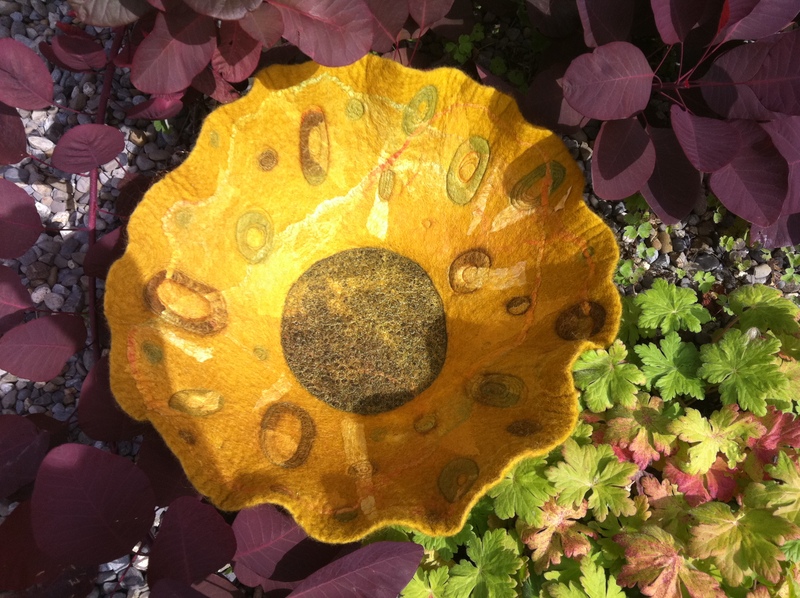 I did however decide to upload the large autumn coloured stitched vessel that I felted for the rare breeds show at Gosford. It’s available for $120 at the moment and if you put the code OCTATCLASHEEN in at the checkout stage you get a 15% discount until the end of this month. This is a BIG felt vessel!!! Finally I had a query about a video record/nuno felt scarf tutorial which I uploaded to YouTube a long time ago, here’s the link again for those of you new to this blog and who just might be interested in the info it contains! This entry was posted in Felt, Felt for sale, Felt in Focus, Free machine embroidery, nuno felt, workshops and tagged Clasheen, Felt, felt bag, felt for sale, felt vessel, felt workshop, Felting, nuno felt, nuno felt tutorial, raw wool bag by Nicola. Bookmark the permalink. Heading over to look at the uploads on Facebook and YouTube. Pity about the light – looking forward to seeing the new landscapes – it’s the same weather here though! 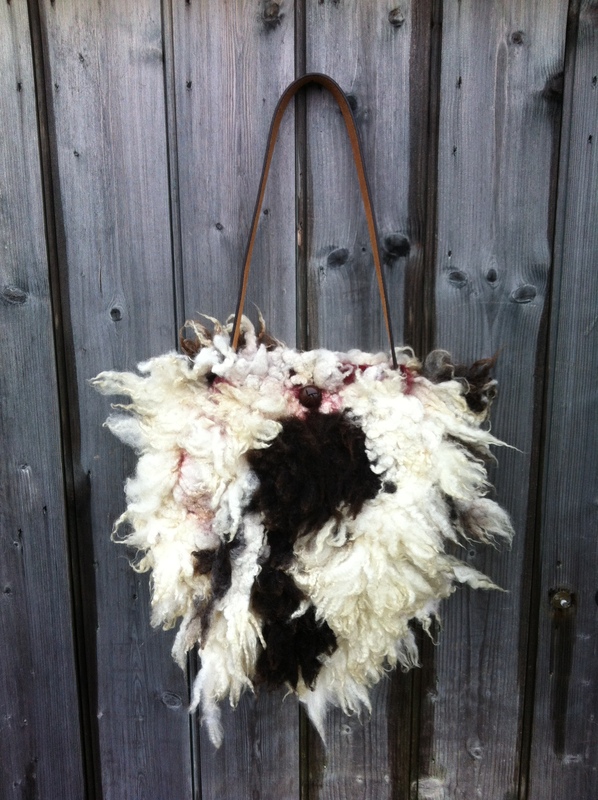 The bag is lovely and those colours work well together – it looks so soft you want to reach out and touch it.